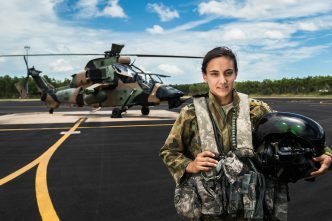 The Australian Defence Force has made considerable progress over the past few years in incorporating a gender perspective across its training and operations. To support the WPS (women, peace and security) agenda, the Defence Department has developed a dedicated capability, introduced operational orders directing the inclusion of a gender perspective and deployment of gender advisers, and disseminated a doctrinal note on gender in air operations. In the context of natural disaster responses, the ADF has effectively integrated a gender perspective in recognition of the contribution that women make to operational effectiveness. However, there’s an aspect of WPS that remains largely unexplored in these operations: the participation of military women and the outcomes they achieve. An analysis of ADF disaster response operations in the Philippines and Fiji shows how critical female representation and participation are and suggests that the ADF needs to focus more on this pillar to enhance its operational outcomes. In response to Typhoon Haiyan (known locally as Yolanda), which hit the Philippines in November 2013, the ADF deployed a joint task force under Operation Philippines Assist. Although it was conducted before the introduction of formal WPS requirements, the operation achieved significant WPS outcomes due to female participation. In August 2018, as part of my fieldwork in the City of Ormoc, which was extensively damaged by Yolanda, I revisited 10 schools and interviewed teachers and staff about their experiences of working with the ADF. Many teachers remembered ‘the two girls who worked like the boys’, completing tasks such as debris removal, environmental hazard reduction, and restoration of classrooms. These ADF members who did a ‘man’s job’ demonstrated how women can mobilise in the aftermath of a natural disaster to assume ‘non-traditional roles’ such as rebuilding infrastructure and clearing roads and rubble. Female representation in post-disaster environments can influence broader social change. Researcher Sarah Shteir notes this includes women challenging their gendered status in society and being seen as ‘strong, resilient and strategic in their ability to think through longer term family and community needs’. Akin to peacekeepers, military women in disaster response teams act as role models to inspire local women and girls, often within male-dominated societies, to participate in the recovery process. 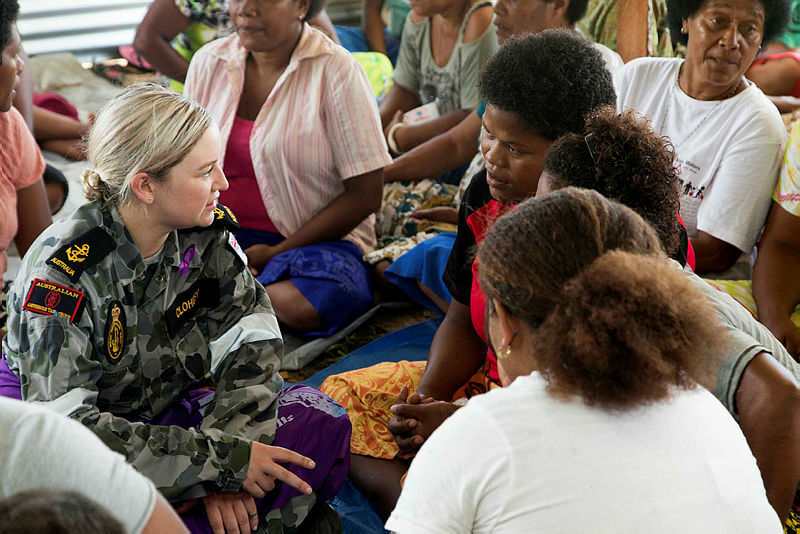 Operation Fiji Assist, conducted in response to Tropical Cyclone Winston in 2016, was the first time ADF operational orders specifically included a gender perspective and required the use of gender advisers. Women and children have specific health needs in the aftermath of natural disasters but ‘may be unable to access assistance safely and/or make their needs known’. In Fiji, this issue was addressed by employing a female gender adviser and ensuring female participation in discussions with local leaders. Those initiatives enabled tailored assistance to be provided to Fijian communities, including sanitary products, nappies, cooking and eating utensils, stationery and school books. The operation’s success was noted by then prime minister Malcolm Turnbull, who said that ‘personnel delivered more effective, targeted help because they were able to connect with local women and target their needs’. This example highlights that ‘in any disaster or conflict, women naturally feel safer and more comfortable talking to other women’. In some societies, women are prohibited or discouraged from speaking with men. Foreign militaries deploying into disaster areas need to be aware of and work within the social and cultural constraints of the communities they are there to assist. It also underscores the need for the ADF to distinguish between a ‘gender perspective’ and participation. 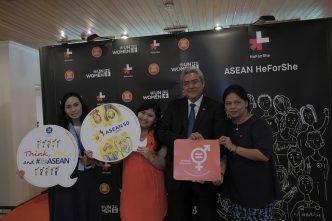 Women’s participation provides a safe environment for vulnerable groups to share gender-specific concerns that aren’t being addressed, including reproductive and sexual health problems and sexual and domestic violence. Integrating a gender perspective into operations entails developing a ‘gendered understanding’ of the disaster or conflict area. It starts in the preplanning phase and involves assessing the differing needs of women and girls as well as of men and boys, and incorporating that information into operational design and actions. These case studies demonstrate that one of the real powers of WPS lies in participation, because it can change people’s views of what women can do and achieve, both within the ADF and in the local community. One reason for low female participation in the Australian Army is the way in which women in ‘non-traditional’ roles are viewed by society. However, the women deployed during these operations challenged those perceptions by being fully integrated into a breadth of operational tasks, from engineering to key leadership engagement. The Royal Australian Air Force has recognised the need for occupation-specific efforts to increase the number of women in roles that engage directly with the local population during natural disaster responses. 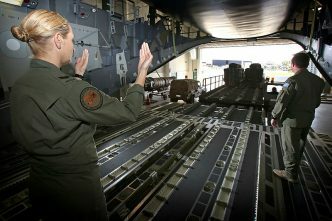 In 2016, the commander of the air mobility group directed an increase in female loadmasters, noting that it would ‘improve interactions with people and communities in those countries most impacted by disaster’. Equivalent initiatives need to be introduced in the other services—particularly the army, which is predicting that ‘the actual percentage of women in the force in being is likely to decline’. A starting point would be building knowledge of occupations in which female participation would enhance operational effectiveness and conducting targeted initiatives to increase representation. Liaison officers, engineers and linguists are some positions that come to mind. 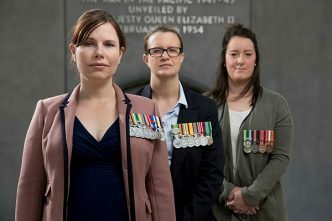 The message about female participation can become mixed up with ADF cultural reform programs, including the Broderick review, making it a ‘politically laden … issue of women’s rights and participation’ rather than ‘performance on operations’. 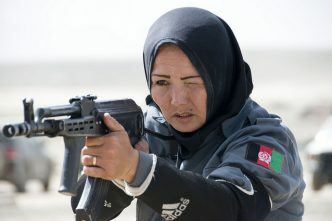 However, it’s clear that operational outcomes are improved by female military participation and that that’s where the ADF needs to focus its WPS efforts. Emily Chapman is a PhD student at UNSW Canberra researching civil–military interaction during disaster relief operations. She is also an Air Force Reserve operations officer with a broad range of international and domestic operational and exercise experience. Image courtesy of the Department of Defence.